LATTICEEASY is a C++ program for doing lattice simulations of the evolution of interacting scalar fields in an expanding universe. The program is designed so that you can easily do runs with different parameters, and more importantly can easily introduce new models to evaluate. CLUSTEREASY is the version of LATTICEEASY designed to run on clusters of parallel computers. The CLUSTEREASY files can be downloaded from the download page and instructions for using them can be found in the LATTICEEASY documentation. The documentation for LATTICEEASY is available in PDF or HTML. This document gives detailed instructions on using LATTICEEASY, as well as discussion and derivations of all the equations used in the program. 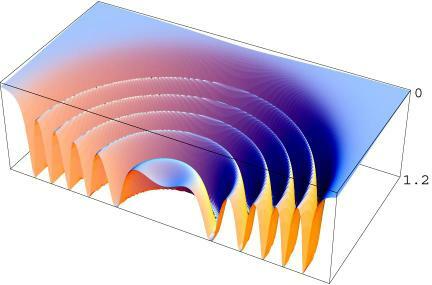 There are several other programs available for simulating fields in the early universe. CUDAEASY by Jani Sainio is a GPU-accelerated program designed to have an interface very similar to LATTICEEASY. PSpectre by Richard Easther is based on a pseudo-spectral algorithm, where the fundamental variables are the momentum modes of the interacting fields..
Visit www.felderbooks.com for information about Gary and Kenny Felder's textbook Math Methods for Engineers and Physicists, as well as links to their other work.